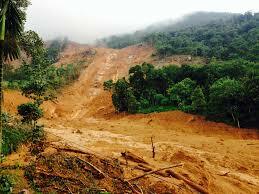 "Sampath Speaking" - the thoughts of an Insurer from Thiruvallikkeni: mudslide in Sri Lanka kills people ~ what is AOG ? mudslide in Sri Lanka kills people ~ what is AOG ? Many of us do not really appreciate the good things in life ~ and would understand the calamities, only when we see them for real ~ worser still, if one were to face them !! In Insurance parlance, one would often come across ‘Act of God’ [what will it be for atheists ?] ~ it could be defined as natural disaster outside human control, such as an earthquake, flood, cyclone or tsunami, for which persons are not responsible. An Act of God may amount to an exception or an "insured peril" in an insurance policy. This phrase would generally ring an alarm bell, making one think of natural disasters like : hurricanes, tornadoes, earthquakes, hail, or floods. However, what it can include can be fuzzier than most people realize. A fire arising out of lightning would fall under this .. .. In hilly areas and in US, landslides occur and can be caused by a variety of factors including earthquakes, storms, volcanic eruptions, fire and by human modification of land. Landslides can occur quickly, often with little notice and the best way to prepare is to stay informed about changes in and around your home that could signal that a landslide is likely to occur. In a landslide, masses of rock, earth or debris move down a slope. Debris and mud flows are rivers of rock, earth, and other debris saturated with water. They develop when water rapidly accumulates in the ground, during heavy rainfall or rapid snowmelt, changing the earth into a flowing river of mud or “slurry.” They can flow rapidly, striking with little or no warning at avalanche speeds. They also can travel several miles from their source, growing in size as they pick up trees, boulders, cars and other materials. Landslide problems can be caused by land mismanagement too, particularly in mountain, canyon and coastal regions. In areas burned by forest and brush fires, a lower threshold of precipitation may initiate landslides. What we have not experienced and not much read is ‘mud slide’ – a mudflow is a form of mass wasting involving "very rapid to extremely rapid surging flow" of debris that has become partially or fully liquified by the addition of significant amounts of water to the source material. Mudflows contain a significant proportion of clay, which makes them more fluid than debris flows; thus, they are able to travel farther and across lower slope angles. Mudflows are often called mudslides, a term applied indiscriminately by the mass media to a variety of mass wasting events. We are not talking of the mudflows arising from outbursts of volcanoes. In neighbouring Srilanka, mudflow is wreaking havoc. 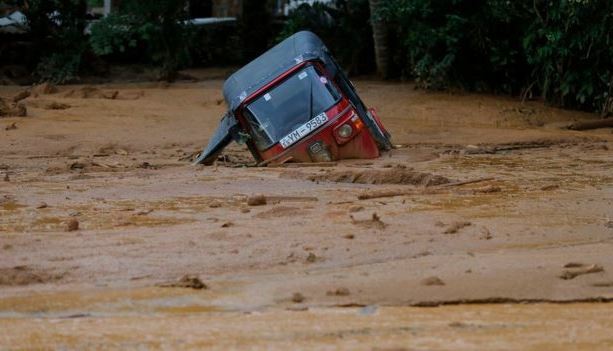 Sri Lanka has appealed for outside help as the death toll from floods and mudslides on Saturday rose to 100 with 99 others missing. The Disaster Management Center states that more than 2,900 people have been displaced. ABC.net reports that military used large armored vehicles and boats to transport people to safety. But some remained trapped in interior villages where boats have been unable to reach. At an intersection close to Agalawatte, 98 kilometers (60 miles) south of Colombo, the capital, some deaths were reported, awaiting boats to be taken to a temple where displaced people have taken refuge. The Sri Lankan government appealed to the United Nations as well as other countries for help with rescue and relief measures. Mudslides have become common during the monsoon season in the tropical Indian Ocean island as land has been heavily deforested to grow export crops such as tea and rubber. Last May, a massive landslide killed more than 100 people in central Sri Lanka. In Indian Insurance Contracts [specifically Engg: EAR/CAR] Acts of God claims shall mean the claims arising out of a) Earthquake - Fire & Shock; b) landslide /Rockslide /Subsidence; c) Flood/Inundation; d) Storm/tempest/hurricane/typhoon/cyclone/lightning or other atmospheric disturbances.. .. .. now one can ponder whether ‘mudslide’ would be construed as an AOG peril ~ and whether in a named peril policy stating ‘Subsidence and landslide including rockslide’ – would include ‘mudslide’ as well !!! !